Suggestions that a £300m Government funding package to support peace in Northern Ireland could hinge on the approval of Theresa May’s withdrawal agreement have been labelled “appalling and distasteful” by the DUP. Secretary of State for Northern Ireland Karen Bradley unveiled the new ‘PEACE Plus’ grant programme on Thursday, declaring that the Government had committed to contributing millions of pounds “as part of its unwavering commitment to uphold the hard-won peace in Northern Ireland after Brexit”. But the commitment to deliver new peace funding until 2027 appeared to be tied to the ratification of the Prime Minister’s widely-unpopular Brexit deal in the Commons next Tuesday. Mrs Bradley said the funding package – designed to the succeed the current cross-border peace-building programme that started in 1995 – was “a clear example of the certainty that the withdrawal agreement provides to the people of Northern Ireland and why it should be supported”. DUP MEP Diane Dodds accused the NI Secretary of using the issue of peace funding as “a bargaining chip aimed at securing more votes for the flawed deal”, branding the move “disgraceful and disingenuous”. And she called on the Prime Minister to clarify the Government position and to “reiterate all-weather commitments to peace funding in Northern Ireland in all eventualities”. Last May, the EU set out its plan to make £109m available to continue peace projects in Northern Ireland post-Brexit. 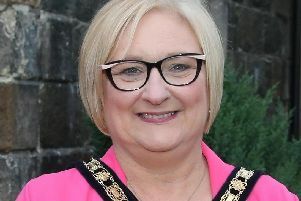 Mrs Dodds said: “Brussels has also made clear in its no-deal Contingency Action Plan in December that the EU would ensure that ‘current programmes between the border counties of Ireland and Northern Ireland continue in all scenarios’. In a visit to Belfast on Friday, Mrs Bradley was asked by the Press Association of the £300m peace funding was dependant on the ratification of the PM’s deal.